What has been a nightmare season for the Blackhawks has the potential to get a lot worse. Goaltender Corey Crawford, who missed nearly 10 months recovering from a concussion suffered almost exactly one year ago, was concussed again in Sunday night’s 7-3 loss to the Sharks. Crawford was bowled over by teammate Dylan Strome as Strome, Logan Couture (with the puck), and Evander Kane (who was whistled for interference) all arrived on net at the same time. The back of Crawford’s head struck the post. Crawford was immediately taken out of the game. The Hawks had no word on his condition, but they’ve got to be prepared for a long absence. Crawford missed the final 47 games of last season plus two weeks to start this year, after he tried to play through a concussion last December, only for his symptoms to get progressively worse. Crawford, who turns 34 at the end of the moth, has been just okay since returning, racking up a .902 save percentage with a 3.28 GAA. His backup, Cam Ward, has been much worse, so when Crawford is placed on IR, likely call-up Collin Delia could be handed the starting job. (Anton Forsberg, also at Rockford, is another option.) 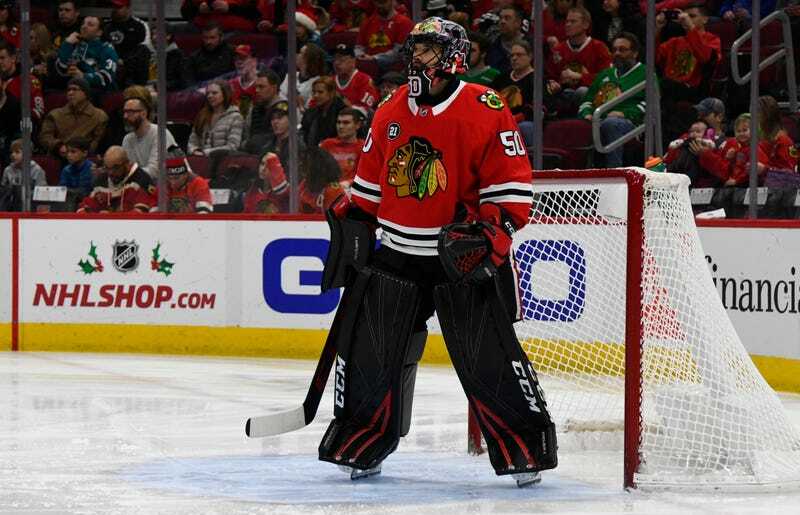 Crawford, who has one more season on his contract after this one, had been mentioned as a potential trade target if Chicago truly decides to blow up the team. The Blackhawks are 10-19-6, ahead of only the Kings in the race for the NHL’s worst record—and for American wunderprospect Jack Hughes.